If you experience ongoing pain in the area near your ear, your jaw or the muscles on the side of your face, possibly accompanied by a clicking or popping sound or restricted jaw movement, you may be suffering from TMJ — an abbreviation for Temporomandibular disorders. 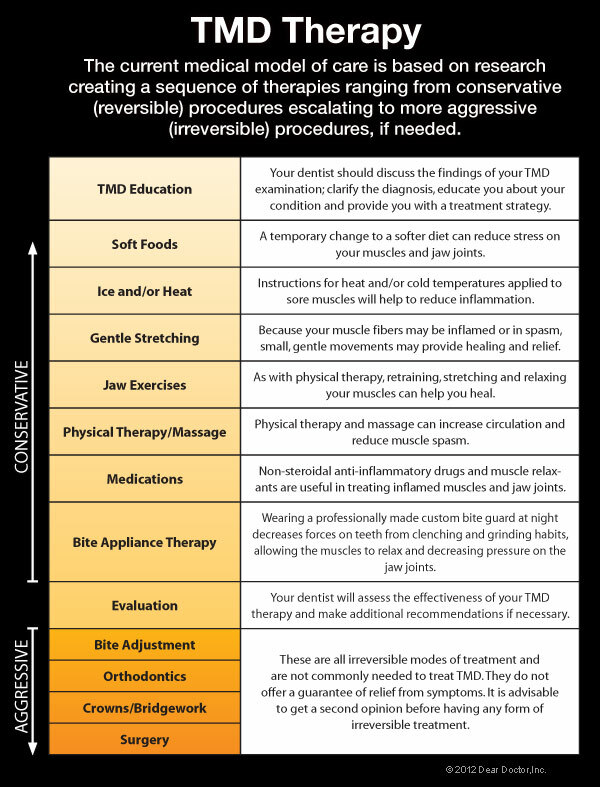 TMJ, then, describes a group of conditions characterized by pain and dysfunction of the TMJ and/or the muscles surrounding it. It’s not always so easy to figure out exactly what’s causing these symptoms, but the good news is that most TMJ cases resolve themselves with the help of conservative remedies that you can try at home. In fact, it’s important to exhaust all such reversible remedies before moving on to anything irreversible, such as bridgework or surgery. For immediate assistance regarding TMJ treatment, please don’t hesitate to contact our Scottsdale dental practice for more information on TMJ and TMD. The two TMJs that connect your lower jaw, the mandible, to the temporal bone of the skull on either side, are actually very complex joints that allow movement in three dimensions. The lower jaw and temporal bone fit together as a ball and socket, with a cushioning disk in between. Large pairs of muscles in the cheeks and temples move the lower jaw. Any of these parts — the disk, the muscles or the joint itself — can become the source of a TMJ problem. If you are in pain, or are having difficulty opening or closing your jaw, a thorough examination can help pinpoint the problem area; then an appropriate remedy can be recommended. As with any other joint, the TMJ can be subject to orthopedic problems including inflammation, sore muscles, strained tendons and ligaments, and disk problems. TMJ is also influenced by genes, gender (women appear to be more prone to it), and age. Physical and psychological stress can also be a factor. In some cases, jaw pain may be related to a more widespread, pain-inducing medical condition such as fibromyalgia (“fibro” – connective tissues; “myo” – muscle; “algia” – pain). Clicking Sounds — Some people with TMJ hear a clicking, popping or grating sound coming from the TMJ when opening or closing the mouth. This is usually caused by a shifting of the disk inside the joint. Someone standing next to you might even be able to hear it. Clicking by itself is actually not a significant symptom because one third of all people have jaw joints that click, studies show. However, if the clicking is accompanied by pain or limited jaw function — the jaw getting “stuck” in an open or closed position, for example — this would indicate TMJ. For more information on TMJ Treatment, call Waterfront Dentistry LLC in Scottsdale, AZ at (480) 949-7900!